Editor’s note: Like the other contributors to this symposium, Nancy D. Campbell celebrates the 40th anniversary of David F. Musto’s The American Disease by noting the book’s landmark status in her own intellectual journey. She is author of Using Women: Gender, Drug Policy and Social Justice (2000); Discovering Addiction: The Politics of Substance Abuse Research (2007); co-author with JP Olsen and Luke Walden of The Narcotic Farm: The Rise and Fall of America’s First Prison for Drug Addicts (2008); and co-author with Elizabeth Ettorre of Gendering Addiction: The Politics of Drug Treatment in a Neurochemical World (2011). “We are, however, an impatient people.” Thus ended the Expanded Edition of The American Disease, which opened my eyes to the underlying history of the War on Drugs that was unfolding in the late 1980s. Musing about returning to graduate school from a vantage point high in the Coast Range in Mendocino County, California, I was riveted by the contradictions of the historical moment. On rare occasions when there was network reception at my remote outpost, the War on Drugs appeared to target pregnant, African-American women using crack-cocaine. Yet in the Emerald Triangle realities, there was paramilitary action against pot-growers. What was the War on Drugs, I wondered, if it meant so many things to so many people? 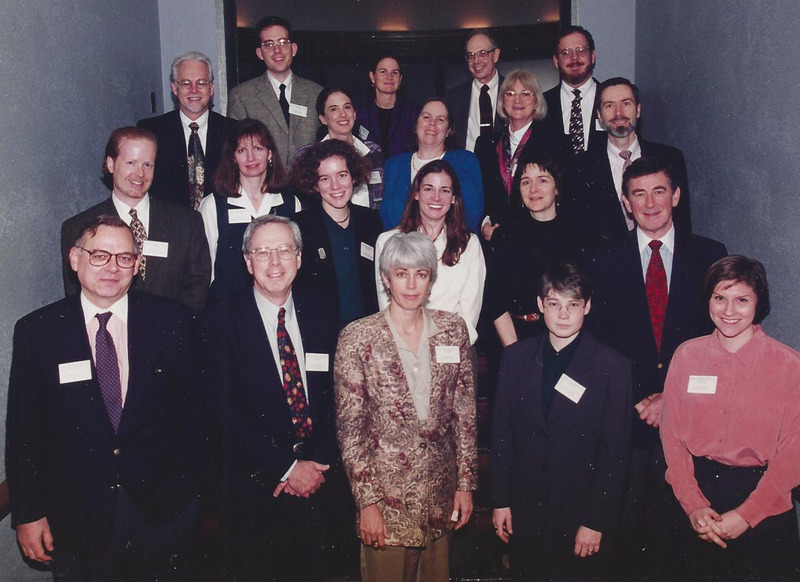 David F. Musto (bottom left) hosts drug policy historians, young and experienced, at Yale in 1996. 1st row: David Musto, Stephen Kandall, Caroline Acker, Nancy Campbell, Mara Keire; 2d row: Tim Hickman, Rebecca Carroll, Sarah Tracy, Jennifer Gold, Susan Speaker, Peter Bourne; 3rd row: William White, Pamela Korsmeyer, Ann Blanken, Ruth Engs, David Courtwright; 4th row: Joseph Spillane, Jill Jonnes, John Burnham, –. By the time I began thinking about all that was left out of The American Disease, I had left behind the Mendocino hills for the History of Consciousness Program at the University of Santa Cruz. There I gained multiple literacies and arcane vocabularies of colonial discourse, feminist and postcolonial theory; Critical Race Theory of racial formation; the discourse of ‘social construction’ central to cultural studies of medicine and Science and Technology Studies; and Foucault’s work on power/knowledge. The American Disease seemed rife with potential dissertation topics once I learned to read between the lines for the unspoken and under-represented Other. The loneliness of dissertating left me convinced that untold stories of great value pervaded the social history and cultural impact of U. S. drug policy. The American Disease was of great help to me in framing a dissertation on the adolescent addicts of the early 1950s, and in foreshadowing my later work. Although Musto might not use the term ‘discourse’ or trace the peculiar convergence between ‘therapeutic ‘ and ‘scientific’ repertoires and those issuing from judges, police, and law enforcement, the book gave me the courage of its convictions in relentlessly tracing oscillations between prohibitionist tendencies and moments of tolerance, and enabled me to see convergence and divergence between the social processes of criminalization and medicalization. Dissertations are written for committees, When I wrote mine, I had no sense that there existed a drug policy history community. My intellectual powerhouse of a committee had little knowledge or interest in drug policy—perhaps owing to my idiosyncratic enthusiasm, they expressed arms’-length fascination with my topic and relief at finding themselves intrigued with the changing patterns of the racialization and representation of ‘the drug problems’ of the 1950s. In that era, the Science Wars preoccupied us, and there were other struggles to wage: critical resistance to mass incarceration; the technologization and molecularization of everything; the proliferation of new identities beneath the banner of ‘disease’ and injury; and new political rationalities to historicize and deconstruct. But David Musto had convinced me that drugs were of perennial significance to American life, and through him I eventually found others who thought so. And now we have a blog! Much gratitude goes to David Musto for shaping the social life of drug policy history. When I first met him at the Yale gathering in 1996, he struck me as familiar because he reminded me of my father and grandfather, both physicians in small-town Pennsylvania. There was something uncannily paternal about him, and it wasn’t just the glasses, but the patient, diagnostic air about him. David Musto was diagnosing this condition, this American disease, through his writing on the subject. Symptomatic of the disease was an “inherent symmetry between excessive praise of drugs in the phase of rising tolerance, and zealous and at times prejudiced denunciation of users in the decline phase” (p. 277). The disease metaphor suggests a relentlessness, an inevitable oscillation no matter what social forces, modes of consciousness, or historical contingencies matter within the social body at any given moment. Yet the book offered a capacious diagnostic framework for each new project of drug policy history. It is our Order of Things, our Diagnostic and Statistical Manual (DSM), an archeological project that managed both to constitute our field and enable the proliferation and diversification of the imaginative parameters within which we work. And if we keepers of Les Mots et les Choses impatiently await the next discursive shift, it is with a good-natured dose of historically-informed irony. We are an impatient people who owe much to the patient, almost diagnostic, sensibility of the author of The American Disease. If you can identify the remaining participants in the photograph above, please let former contributing editor Nancy D. Campbell know. Her only excuse is the very symptom about which she has written the most: historical amnesia. I am grateful to Nancy Campbell for organizing this symposium and to those who participated. Perhaps there could be similar memories and discussions of other scholars whose work is relevant to ADHS.